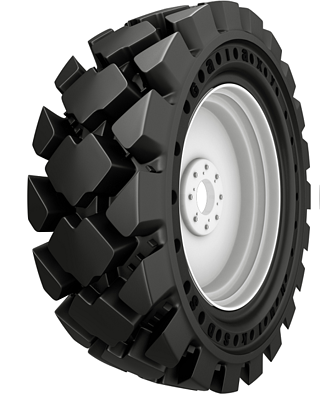 Alliance Tire Group introduced the Galaxy Hulk Deep-Tread SDS, a skid steer tire whose massive block tread pattern—long a favorite among operators in tough conditions—is now backed up by solid construction for the toughest challenges in material handling, construction and farming. The Hulk SDS is the latest addition to the Galaxy severe duty solid (SDS) line, which also contains solid versions of such popular tread patterns as the company’s Beefy Baby and Yardmaster tires. “As part of the growing Galaxy SDS solids lineup, the Hulk SDS delivers the same industry-leading tread pattern and depth that has made it popular worldwide, now in a solid design for even longer service life,” says Seth Walters, Manager-Special Product Programs for Alliance Tire Americas. The chevron-and-block pattern of the Hulk SDS tread provides excellent self-cleaning while delivering long service life on all surfaces with its high 68-percent rubber-to-void ratio, he notes. “In severe service use, the solid Hulk ensures that downtime is virtually eliminated, load capacity is increased and tire life is more than doubled,” Walters adds. “The Galaxy Hulk SDS has been introduced in two extremely popular sizes—30x10-16 and 33x12-16—with and without apertures. We’re seeing a lot of excitement about the new Hulk SDS from people who use their skid steers in real severe duty situations, including waste handling facilities, scrap metal yards, steel mills, rock quarries, dairy farms and other sites where puncture and excessive wear are constant challenges. “People are telling us that the Hulk SDS is exactly the tire they’ve been waiting for,” he says. Learn more at your ATG/Galaxy dealer or visit www.atgtire.com or see it on display at the ATG booth at World of Concrete in Las Vegas, January 17 through 20.